The Firemouth Cichlid, Thorichthys Meeki, comes from Central American areas such as Mexico and Belize. It is also known as the Red Breasted Cichlid. They are named such due to the fiery coloration on the underside of their mouths and from the tail to the mouth, it has a vivid red throat and belly. On average their size is about 6 inches but they can grow larger and on the whole are a good fish for beginners to aquariums to work with and they can live up to 15 years. Water temperature should be between 75°F and 80°F and the pH between 6.5 and 7.5 although they are a pretty durable fish and can adapt to many water types. Water will need weekly changes of at least 15% to 20%. 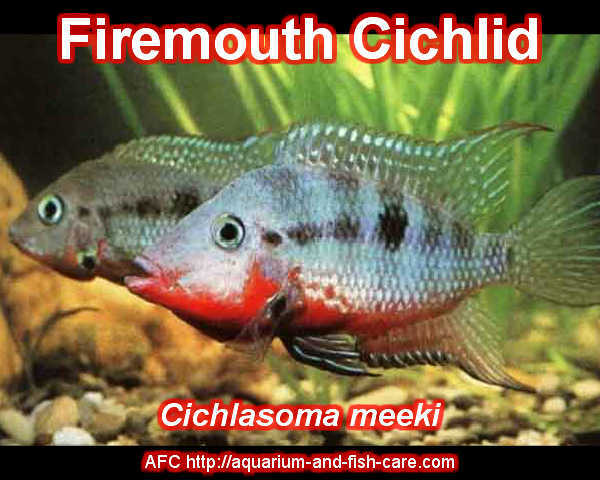 Like most Cichlids, the Firemouth is carnivorous and prefers live foods such as brine shrimp, bloodworms or crickets. They are not picky though and will eat frozen food, pellets, and flakes happily. Be sure to feed food that has a good protein content and vary the type of food given so that the fish can receive a mixture of nutrients, vitamins, and minerals to stay healthy. In the case of baby Firemouth, a mixture of baby brine shrimp and crushed flakes should suffice. Since the Firemouth fish likes to hide, it is good to include broken flower pots and piles of rocks for them to enjoy the nooks and crannies. Some water plants can be used but the Firemouth likes to dig in the substrate and so can easily damage or kill plants unless the plants are potted. The Firemouth Cichlid prefers a sandy tank bottom with broken driftwood but leaves an open area in the center of the tank for them to swim in. Firemouth Cichlid is egg layers and prefers to do so on flat rocks or overturned flowerpots and they can get extremely aggressive during their breeding period. In general, they can be highly territorial and aggressive towards other fish and so should be monitored if in the same tank as other species or if you have more than a pair of them. Always keep a close eye when introducing fish into the same aquarium as the territorial battles can result in stress and death.